This 20.2 acre pocket of wilderness is the 2nd largest track of native forest inside the 610 loop and more than 2 acres of wetland areas have been documented on the property. The wetlands in the Park are a mixture of Palustrine Emergent (PEM) in the areas of grass or sedges, and Palustrine Forested (PFO) where there are trees. At least 38 species of native trees have been surveyed in the park, which attract many migratory animals throughout the year. Water Oak, Loblolly Pine, Willow Oak, Live Oak, Sweet Gum and Hackberry are just some of the native trees that can be found in the park. The following list of non-native species has been found in the park: Chinese Tallow, Chinaberry, Mimosa, Glossy Privet, Tree of Heaven, Heavenly Bamboo, Pink Lantana, Japanese Honeysuckle and Jerusalem Cherry. Friends of West 11th Street Park work on an ongoing basis to identify and remove non-natives from the park. 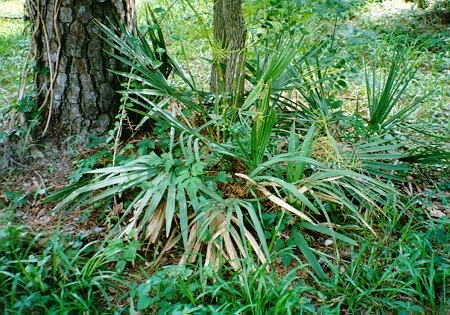 BELOW ARE JUST SOME OF THE PLANTS THAT CAN BE SEEN AT WEST 11TH STREET PARK. CLICK ON EACH TO LEARN MORE. Interested in adding low-care, native plants to your garden? Visit this link to find out what will grow in in your garden in Houston.